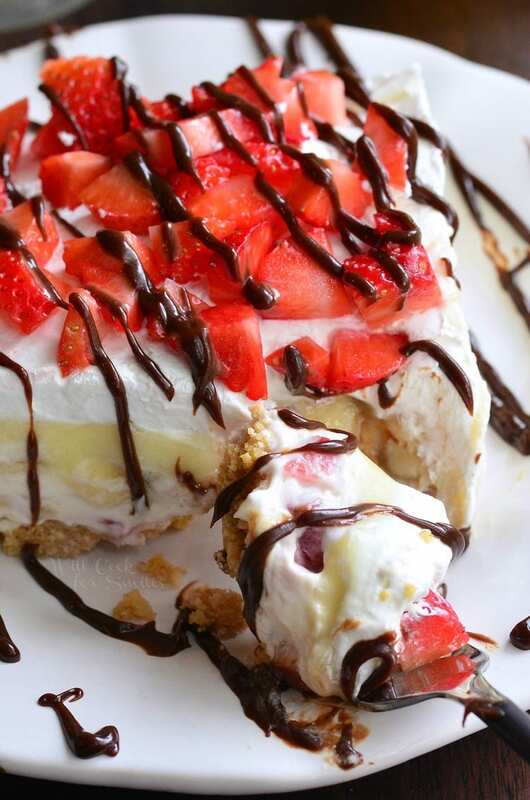 Easy summer dessert loaded with fresh, juicy berries and requires no baking time. 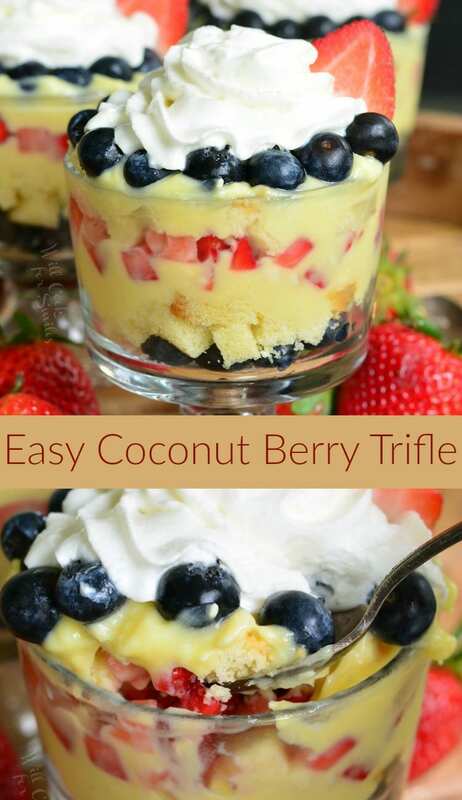 This Coconut Berry Trifle is made with layers of buttery pound cake, blueberries and strawberries, and coconut pudding. 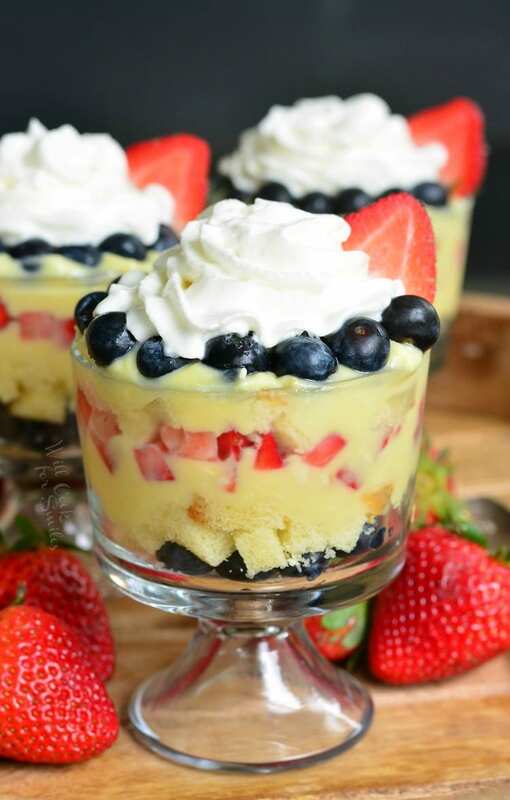 The combination of flavors and textures in this berry trifle is absolutely delightful. Here we are, only a couple of weeks away from summer. It’s almost here and I hope you’re ready! I’m so ready for the summer. Little man is actually done with school early and taking a breath of fresh air. Or, more accurately, running around like he’s drunk with freedom. Now we are trying to go to all the places we can possibly squeeze in before schools officially end and tourist season starts. Tourist season is not a friendly time in FL because everyone flocks here in the summer. Our peaceful town is not so peaceful during summer and parking is a nightmare. But, it is still the best city in Florida and I love living here, tourists and all. Little man and I love taking the sight seeing train around town for fun and talking to the tourists. There are so many places to see and I get a thrill from recommending my favorite ones. Along with the summer fun time comes summer heat. I wish the heat didn’t have to be so brutal but it is and it lasts for many months. 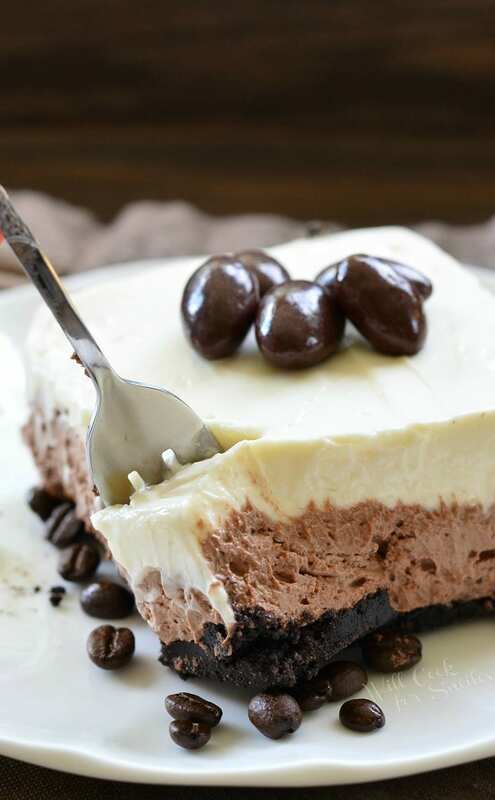 Hard to imagine baking during the summer hear and that’s why I turn to frozen treats, cold desserts, and desserts that require no baking time. 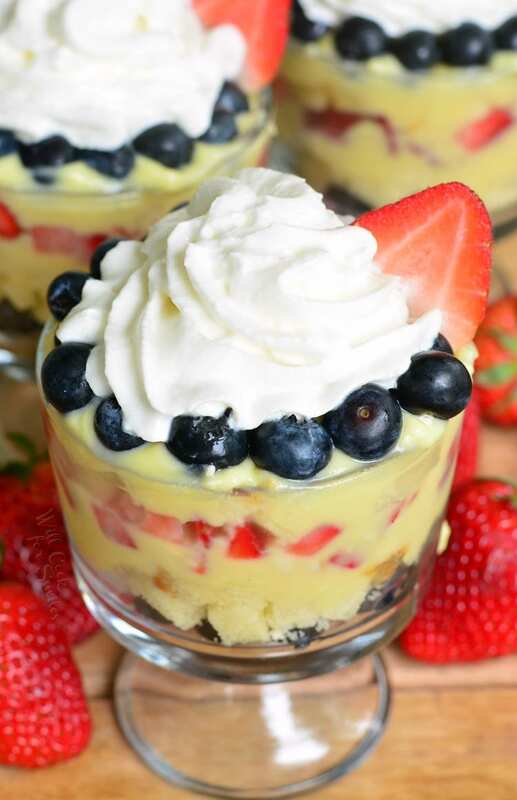 With these tasty trifles, I cheat and get a ready pound cake from the bakery department at the deli. It saves time and I don’t have to turn on the oven. If you wish to make your own pound cake, I have a couple of lovely recipes. You can check out my Strawberry Pounds Cake, Lemon Pound Cake, and a vanilla and chocolate combo. All of these flavors will go very well in this berry pound cake. I think lemon one will actually be a great addition to berries and coconut. Or, you can save time and hear and grab a pound cake next time you’re grocery shopping. 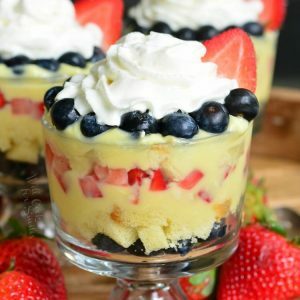 Trifle is a very simple desserts that consists of layers of cake pieces, fruit and berries, and some sort of custard or cream. Flavor possibilities for trifles are truly endless. 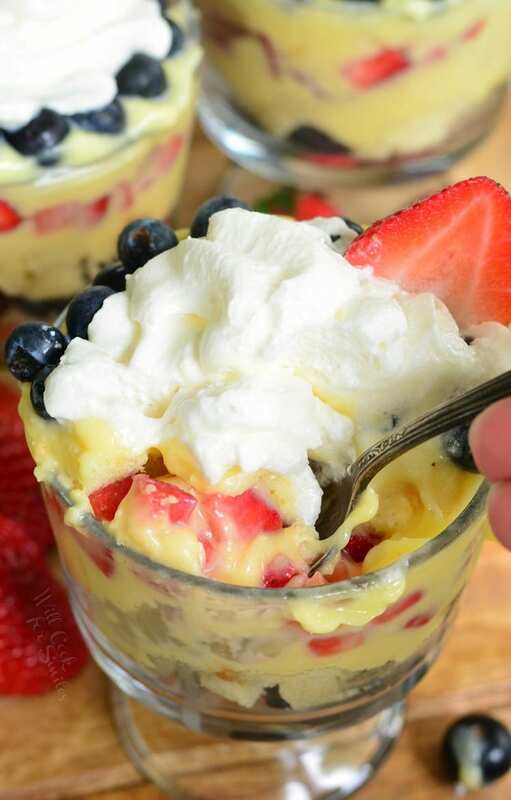 Different fruit and berry combined with a custard, pudding, syrups, and cream. 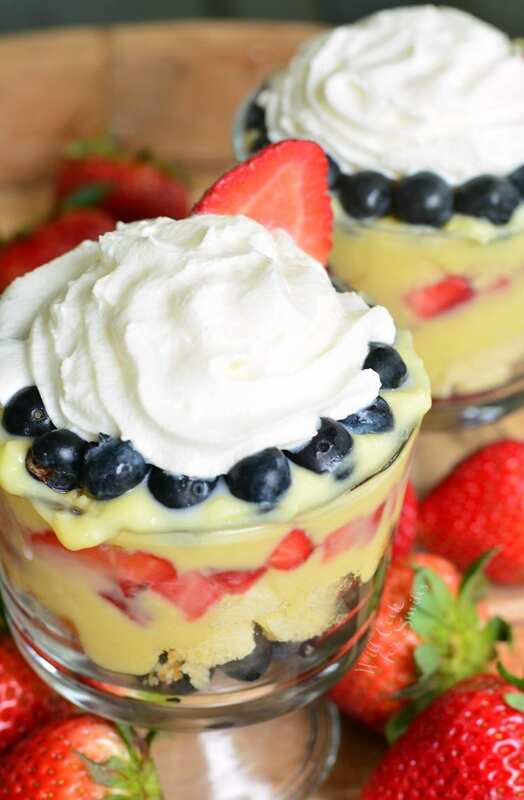 For this simple berry trifle I used a buttery pound cake with layers of blueberries and strawberries. For the creamy component, I used coconut pudding. Coconut pudding is simple to prepare and ready in 5 minutes. Simply get a package of instant coconut pudding and whisk it with cold milk. In 5 minutes, you will have pudding for your trifles. To prepare the trifle, simply chop pound cake into small pieces. Since these are individual trifles, try to get small cubes of pound cake to fit the glasses better. Layer pieces of pound cake with blueberries, chopped strawberries and pudding. Keep trifles refrigerated before ready to serve. 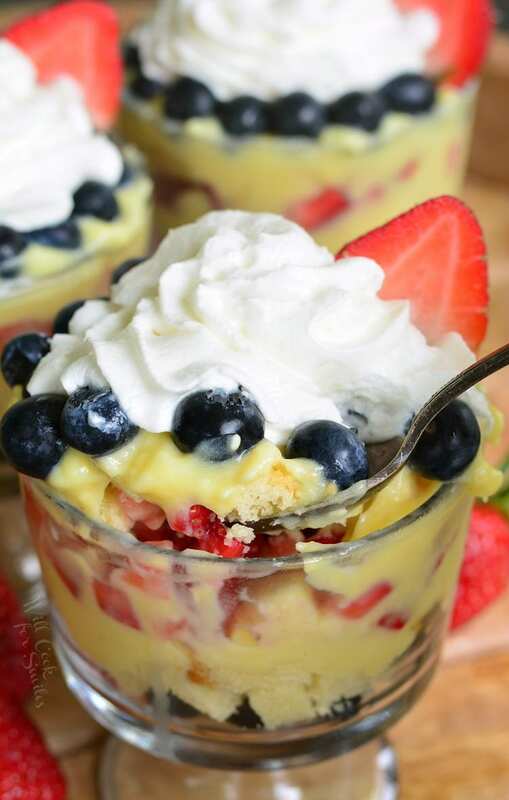 Delicious trifle with layers of buttery pound cake, fresh berries, and coconut pudding. This trifle is simple to make and requires no baking time. Start by preparing coconut pudding. Follow the box instructions to prepare the pudding. Dice pound cake into small cubes. Start by adding half of the blueberries to 4 bowls. Divide half of the pound cake among the 4 bowls. Divide half of the coconut pudding among the 4 bowls. Press down gently as spreading. 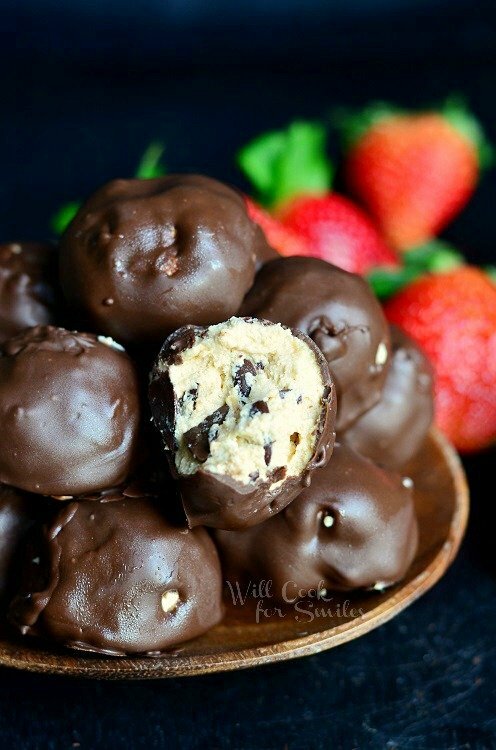 Divide strawberries among the 4 bowls and repeat pound cake and pudding layers. Press bowl gently. Divide remaining berries over the second pudding layer. Add whipped cream on top if desired.